Just how reliable are Spain’s pre-election poll results? Less than three weeks until Spain’s 28th April general elections, a flurry of voter survey polls are being released on a near-daily basis projecting the outcome of the elections. Most polls provide an estimated percentage of the vote to be cast for each political party in the race, arrived at through comparison of the expressed preference of voters surveyed and past-patterns of previous survey responses vs actual vote totals at election time. Then, pollsters crucially rely on complicated in-house formulas based on the estimated vote share for each of Spain’s 50 provinces to come up with a projected distribution of seats in Spain’s 350-member Congress. It’s complicated and controversial, especially in the case of the government’s own mega-survey of public opinion released every two months, known as the CIS Macro-Barometer, which relies on thousands of personal interviews with survey respondents, then jiggers the gross voter preference numbers with its own secret formula to arrive at projections for election day. What makes the CIS findings controversial is that opposition political parties that are not doing well in the polls have alleged government meddling in the survey results, pointing to last year’s appointment as director of the organization of José Félix Tezanos, a former director of polling for the Socialist party (PSOE) of President Pedro Sánchez. On Tuesday, the most-recent CIS Macro-Barometer was released amid great expectation and yet with no great deviation from the results of other recent polls, predicting that the Socialist party stands to win 30.2 percent of the vote for an estimated 123-138 seats in Congress, a marked improvement over the 84 seats the party won in the last general elections in 2016. 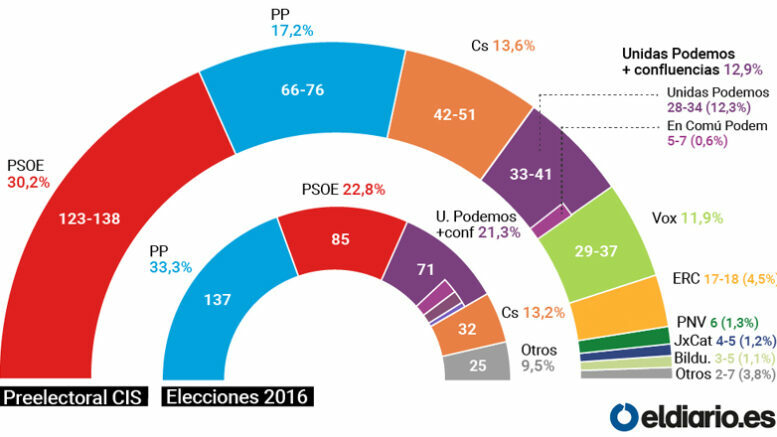 Following the PSOE in the CIS survey projections are the conservative Partido Popular (PP), with 17.2 percent and 66-76 seats; centre-right Ciudadanos, with 13.6 percent and 42-51 seats; left-wing Unidas Podemos , with 12.9 percent and 33-41 seats; and the far-right Vox party, with 11.9 percent and 29-37 seats. Tracking analysis (click to enlarge). The opposition criticism of the CIS notwithstanding, the official government poll results roughly match most other recent surveys by private polling companies in tandem with Spanish news organizations (see table below), placing the PSOE at around 30 percent of the vote, with around 120-125 seats in Congress, followed by the four other parties projected to win the largest share of the vote in the same order as ranked by the CIS barometer. All polls indicate that the PSOE will fall far short of a 176-seat absolute majority in Congress needed to govern comfortably. That means the Socialists will have to look to forming alliances to govern — either with the same set of parties that brought Sánchez to office last May in a no-confidence vote against then-President Mariano Rajoy or with Ciudadanos, which has so far said it will not agree to supporting a PSOE government led by Sánchez. But how accurate are these most-recent polls? Voter preference surveys in Spain are, after all, notoriously out of sync with the actual ballots cast at election time – witness polling projections of a PSOE victory in regional elections in Andalucía in December that ended in a rout after a high-rate of abstentionism among progressive voters unexpectedly handed a dozen seats in the regional parliament to the ultra-right VOX party, giving rise to a right-wing coalition government. 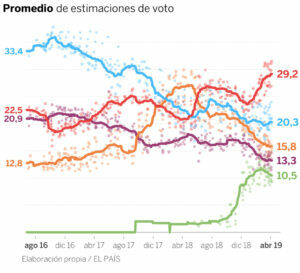 The problem with the accuracy of voter preference surveys in Spain is not new, according to a report appearing today in the daily El País that notes that pre-election polls have been off by an average of 2 percentage points per party in every general election since 1986. But the problem is not innate to Spain, with analysis of polls around the world showing that inaccuracy in polling projections can vary even more, depending on the size of the vote for a given political party — making it much easier to estimate the final vote for a party with 5 percent vote share than one with 30 percent or more of the total ballots cast. And final results can vary substantially depending on how close to election date the survey is taken — the closer to the actual balloting, the more likelihood of survey alignment with the final vote tallies. According to the El País report in today’s paper, the margin of error in polling predictions for a party with around 20 percent of vote share in Spain can be as much as 5 percentage points (plus or minus). To try and reduce the margin of error, polling organizations in Spain are increasingly following the lead of other pollsters around the world who rely on “tracking” projections, or “polls of polls” that try to reach a more accurate prediction of election outcomes by averaging all available polls and then predicting percentages and calculating estimates of seat-by-seat victories based on those averages. 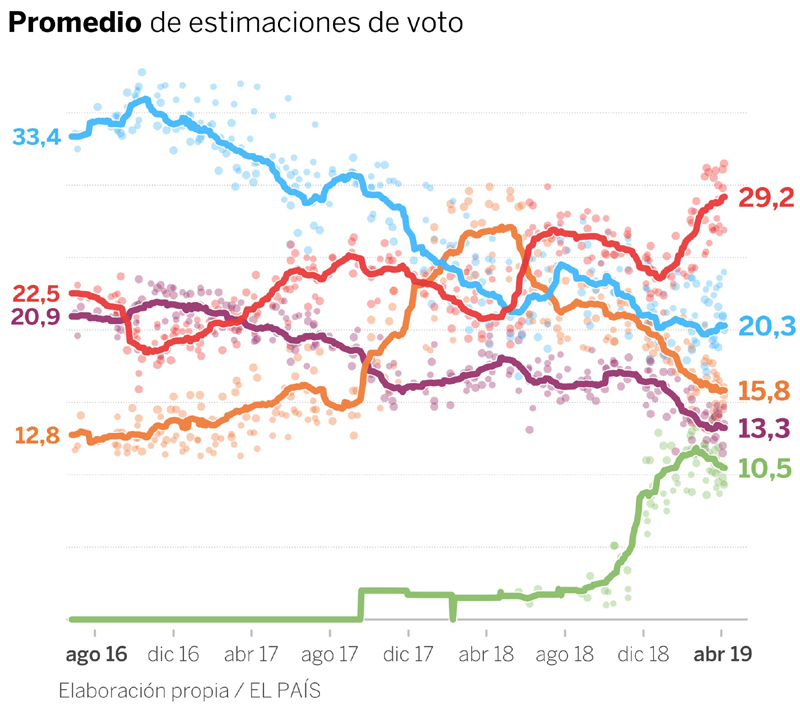 In a tight election contest, such as Spain’s current general election campaign, the possible high margin of error means politicians cannot afford to rely on the accuracy of polling data to ensure their victory. An unexpectedly high or low level of voter turnout, particularly the ability or inability of a party to rally its base to actually show up and cast a ballot at polling stations on election day, can make all the difference in proving the polls right — or showing them to be embarrassingly inaccurate.